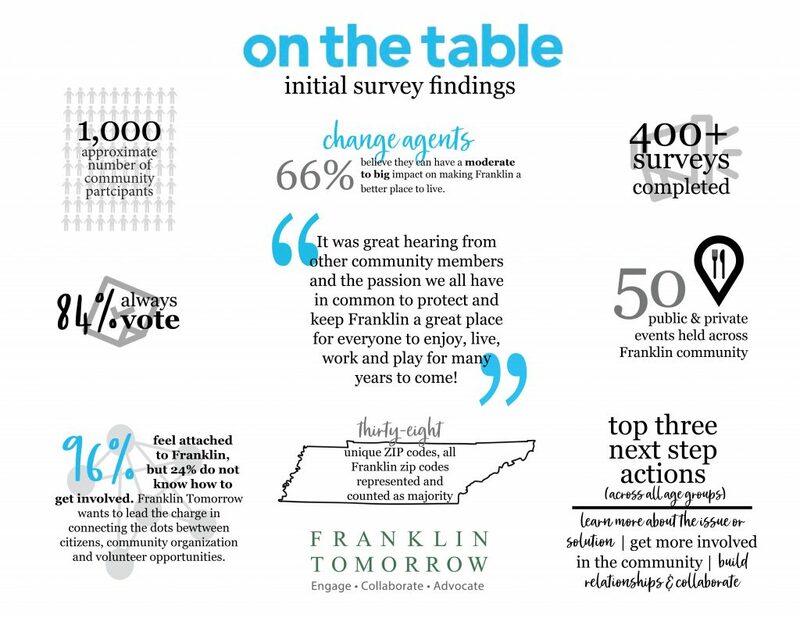 On Tuesday, January 21, 2019, Franklin Tomorrow released preliminary results from the On the Table community engagement initiative, which drew approximately 1,000 participants at 50 public and private events held over a one-week period in October 2018. During the organization’s quarterly Breakfast With the Mayors at Rolling Hills Community Church, Franklin Tomorrow Executive Director Mindy Tate revealed some of the trends from the more than 400 post-event surveys completed by participants. Serving as On the Table co-chairs for 2018 and 2019 are Mary Lee Bennett, Patrick Baggett, Jim Roberts, and Allena Bell, who became the chair of Franklin Tomorrow’s 25-member Board of Directors in 2019. Franklin Tomorrow is a nonprofit, community visioning which has as its mission to engage the community, foster collaboration, and advocate for a shared vision for the future of Franklin. That shared vision is that Franklin will be a city with a robust economy, great people, distinct character, and vibrant neighborhoods. Learn more at www.franklintomorrow.org.